Ramsay was raised in Scotland and would have been a footballer player for Glasgow Rangers if it hadn’t been for a tendency to suffer from injuries. 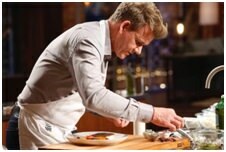 This fed into his reputably highly competitive nature and he related that to his catering career. He was determined to gain the highest accolade in catering and he has 16 times over. It is not just in the catering world that he has been successful. Ramsay has become determined to influence and inspire the British to cook and eat better, especially health food. He is uncompromising in his approach, but he should be listened to due to his success. This is the mistake that many people make with him. This soon came to light with the show Hells Kitchen. ITV realised it might be fun to put Gordon into a proper cooking environment with a bunch of celebrities. Whilst it was a given that Gordon would blow up at some point it was more of a surprise that he was able to inspire and bring out some great skill in several of the celebs. He also seemed very at home in front of the camera. Channel Four came calling with a show called the F word, a play on his expletive strewn self. 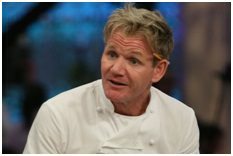 The show featured Gordon dealing with the subject of food and how to cook it. Memorably he raised some Turkey’s in his London home involving his wife and children in their care. The Turkeys were then butchered and cooked by Gordon and fed to his children (with accompanying photos of the birds when alive). Needless to say, they enjoyed them immensely. Gordons next project was to help out struggling restaurants that where not always ready to hear what he had to say, which was foolish as he is one of the best people to be able to cast comment. He is active in many charities and is a keen advocate of a healthy lifestyle. He is also one of the few British celebrities to have cracked both sides of the Atlantic.